Back by popular demand ebp by permission of Bikeology productions ltd present a freewheeling tour through our national obsession with bicycles. 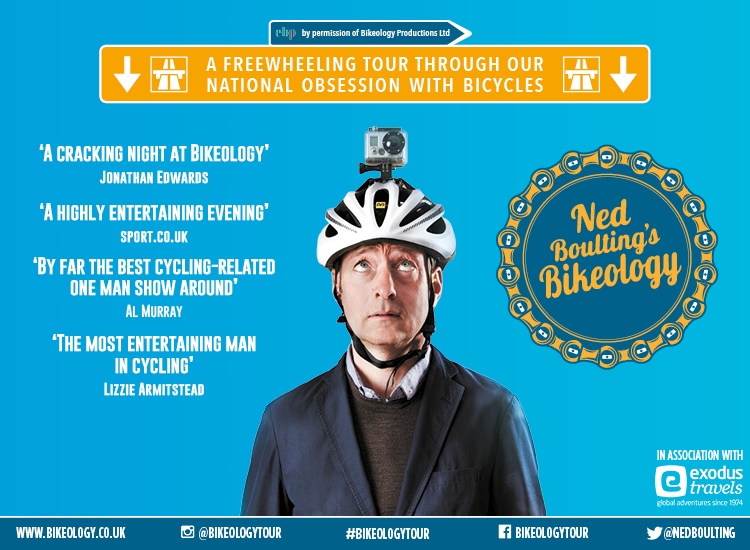 So journalist, television presenter and best-selling author Ned Boulting is back this Autumn with his acclaimed sell out ride through the world of Bikeology, featuring brand new tales from life in the cycling lane, as well as the inside scoop from his time at the 2017 Tour de France. From the humble commuter to the winner of the Tour de France*, Boulting takes an off-centre look at what it means to ride a bike, drawing on his own underwhelming adventures in the saddle to his fourteen summers spent hurtling around France in pursuit of the sport’s biggest names including no less than Cavendish, Wiggins, Froome and of course Armstrong. A breakneck descent through the history of the ever popular sport followed by a lung-bursting climb into the present day - all two-wheeled life is here. Keep your wits about you, as you might find yourself up on stage to compete in Ned’s search for the nation’s Number 1 Bikeologist!